Crazy Shenanigans: Here I Come Vacation!!!! Thanks to the help of 26 people, I was able to book my Jamaican vacation with a whopping discount of 190.00 dollars!! Thank you, Thank you all soooo much! If you decide you want to join that site, feel free to keep using the link because umm..... I love to travel and will keep using the credits. I can't wait till next month! I'll be staying at a great resort. It's all inclusive including food and drinks. I'll never even have to leave the resort if I don't want to. This will be my first trip to Jamaica and the first time in a long time where I'll be taking a vacation that isn't busting with scheduled activities each day. The resort does have some off resort activities so if any of you have ever been to Ocho Rios please let me know things I shouldn't miss! I keep hearing about the Dunn water falls and a lot of people have mentioned zip lining. I'm really only looking for one or two activities because I plan on laying on the beach non stop. I may have even bought 3 new bathing suits for the trip. Wooooooohoooooooooo! Can you tell I'm a tiny bit excited? that's awesome girl!!!! :) And wow.. that is a great price lol. ENJOY!! I can't wait to see pictures! Nice. That looks like an awesome vacation. SO glad you have decided to take me with you. you are the best. I'm excited for you! 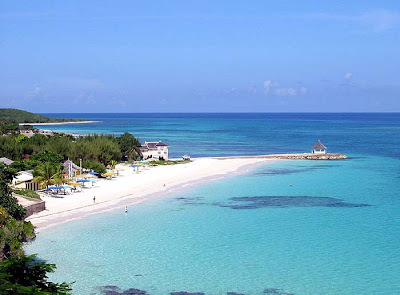 Love having trips to look forward to:) I've never been to Jamaica and can't wait to hear all about it. yes, dunns river falls is a MUST SEE. it's so fun! also, try to hit up a local market outside the resort. it's the best place to get inexpensive items and it's just a more fun, cultural experience. it's been almost 15 years since i've been there! have fun! Pack me in your luggage please!! so excited for you. the pics are beautiful. 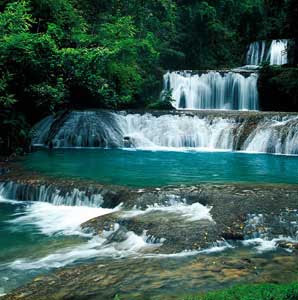 DEFINITELY do Dunn's River Falls and the Tranopy tour. I have pictures on my blog of our trip to Ocho Rios last year. Hey girl! We went to Jamaica on our honeymoon and it was beautiful!!! You will have a blast. We were broke (#medwife) so we mostly stayed at the resort. But I have ziplined before and it was awesome. Wow!! You'll have a fantastic time. I went to ocho rios last year and it was great. I just recently posted a few pics on my blog of Jamaica :-) feel free to check it out http://chaneljibal.com/2011/sunny-jamaica. Enjoy your vacation. That's so cool! You saved a lot. I'm going on a trip in April. Maybe I should do this and try to get people to help a PCV out. I hope you have such a great time in Jamacia. We stayed at an all inclusive in the Dominican Republic. They're awesome. The food was fabulous. Ooo fun! You're going to have a blast! I've been to a lot of places in the Caribbean, but not Jamaica! Feel the rhythm, feel the rhyme! ;) Have a fantastic trip, it sounds like a dream vacation! Yay! And how great you were able to slice almost 200 dollars off of the price! Fun! Where are you staying? We stayed at Rose Hall in Montego Bay. It was amazing. Now wait just a minute! I thought we got to come along with you! ;OP I am super jealous, but so happy for you! Eeek! I'm so excited for you! We want to do a tropical vacation for our one year, so you'll have to make sure you do a full review! Have a blast! omg it looks gorgeous there! Take me with you!! I cant believe you only paid $190! Thats crazy! Have fun girl!! I love how the blogging community pulls together this way. It looks fabulous. Now the painstaking wait, the worst bit!